"Bawling for Columbine: if you plan to go to a mall or a movie theater, check the NRA forecast first (Rush Limbaugh, Sarah Palin, or any other hatemonger will do)." One more tragedy, this time in Aurora, CO. 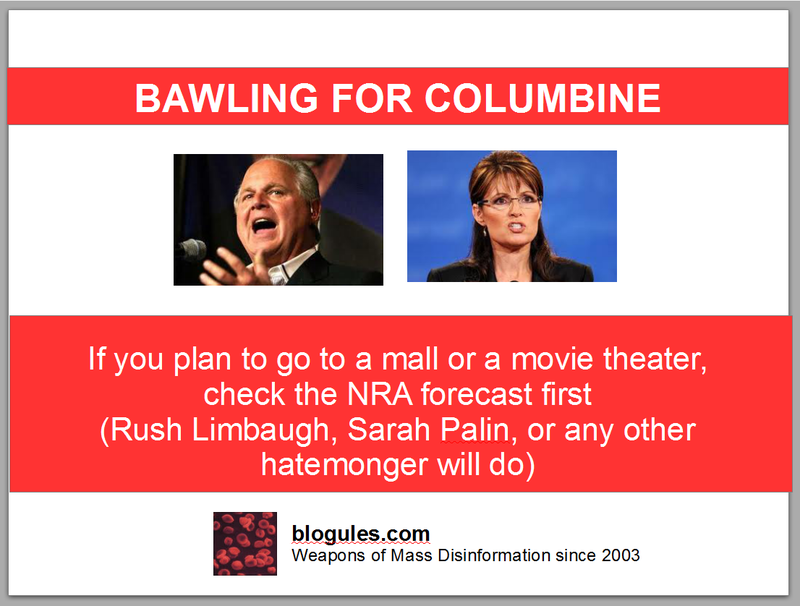 Even if the Rush-Aurora connection is less direct than the Sarah-Tucson one (Limbaugh ranted at the Bane-Bain villain in the latest Batman movie, Palin at Gabrielle Giffords herself), gun control - or lack of - remain the issue. Gun control is to weapons what democracy is to politics. The NRA imposture is undermining democracy. NEW: join blogules on Facebook!!! Q: Why are so many US voters considering replacing the guy who's selflessly trying to fix the system with the guy who's shamelessly profiting from the failures of the system? 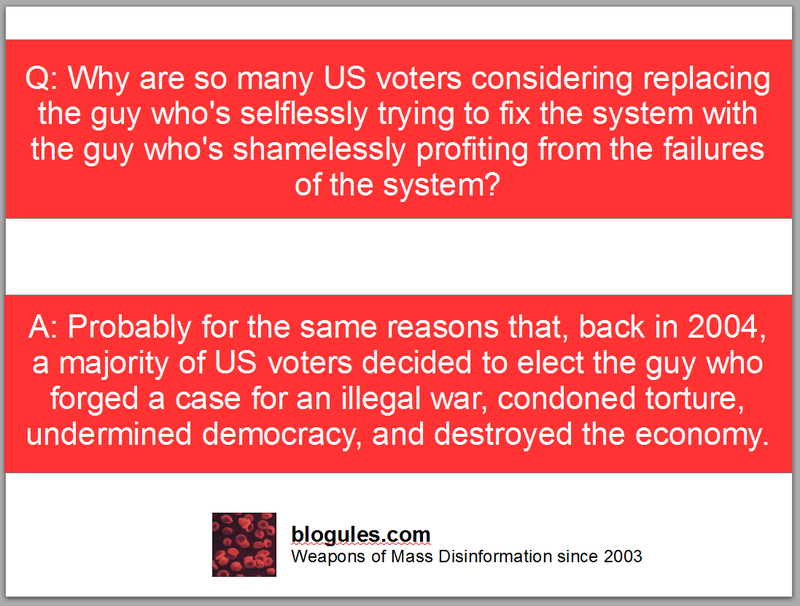 A: Probably for the same reasons that, back in 2004, a majority of US voters decided to elect the guy who forged a case for an illegal war, condoned torture, undermined democracy, and destroyed the economy. Didier Raoult: a closet Creationist or just a questionably honest scientist? Still under the shock following the recent triumph of Creationists in Korea (see "The Republic of Korea is under attack. From within. "*), I smelled something very very fishy as soon as I saw this title for a Viewpoint in today's Korea JoongAng Daily: "Life after Darwin". Indeed, this piece seems very much to have been written if not by a closet Creationist, at least by a more than questionably honest scientist. Either way, Didier Raoult is gathering audience. The Director of the Research Unit in Infectious and Tropical Emergent Diseases (URMITE) at the University of the Mediterranee in Marseille is a mass producer of articles criticizing Darwin and more or less directly fueling Creationist propaganda. Ever since the Intelligent Design imposture collapsed (following the publication of the "Wedge Strategy", a document where their 'inventors', the Discovery Institute, detailed their methods and actual political agenda), creationists and fellow fundamentalists have been trying to find more subtle ways of undermining science and democracy. This "Life after Darwin" was published by The Project Syndicate, and also appears in The Cambodia Herald. Interestingly enough, today, the "Particle of God" was to make the headlines following yesterday's press conference at the CERN. Not a good day for science revisionists, who needed to be cheered up with some classic Darwin bashing. Bring'em on! Higgs Bosons will fly. Didier Raoult’s “Life after Darwin” (Korea JoongAng Daily - July 5, 2012) cannot remain unanswered, particularly at a time when scientific revisionism is gaining ground in Korea: Nature recently published an article exposing an alteration of the Ministry of Education’s guidelines for school textbooks following intense lobbying from Creationists. Such a bold attack on democracy would have instantly made the headlines in the US or in Europe, but it didn’t seem to cause much emotion in Korea beyond scientific circles. Here, the message is much more subtle. To say the least, Mr. Raoult is a controversial figure. If he’s always careful to officially keep his distances with Creationism and its offsprings (including the Intelligent Design imposture), he nonetheless uses the same deceitful techniques, and his critiques of their nemesis, Darwin, basically recycle arguments from the past with a modern twist. As a result, Mr. Raoult never manages to convincingly challenge evolution itself, but he constantly contributes to the verbose smokescreen at the core of the Intelligent Design's "Wedge strategy". No wonder his writings are widely circulated among Creationist circles. Mr. Raoult criticizes Darwin and Darwinism very much the way I could criticize Hippocrates and Scientism. For instance, he singles out Darwin’s simplistic representation of the tree of life, but without taking into account the scientific progresses made ever since (believe it or not, there’s evolution in science itself as well, and evolution as a science is already experiencing “life after Darwin”! ), and the way he mocks at Darwinists as members of a cult mirrors the critics waged against Scientism centuries ago. Fundamentally, he’s not tackling the key issue, and he never succeeds in proving evolution wrong. Of course, recent discoveries in his field, and the complexity of ecosystems within every living organism are clearly adding to the scientific challenge, but unfortunately for Mr. Raoult, they are only making evolution even more interesting and stimulating to study. Scientists must always challenge existing theories, and honest scientists are delighted to study new ones when they respect a rigorous scientific approach. Mr. Raoult may be good in his field, he certainly doesn’t respect our intelligence with this very ambiguous piece.